Well, I ain’t never heard of such a thing… that’s what I mumbled to myself last week when I spied these on Pinterest. I’d never seen such a thing either, which is what made me investigate. A bright, chewy-looking bottom smothered with an ooey gooey chocolaty layer covered with a caramel colored crackled top… just stop it. I might not have known what I was looking at but I knew I wanted some! A quick internet search produced dozens of recipes and they all appeared to have Southern roots. I was already intrigued but then to find out these seem to be of Southern descent and I’d never heard tale of them? What the crap? So, I did what I always do when I’m looking for a Southern recipe I don’t have, I checked around on some of my friends’ blogs and lo and behold, my sweet friend, Christy from Christy Jordan's Southern Plate had a recipe (buy the cookbook with the original recipe here). And since her recipe seemed to be what everyone else’s recipe was based on, I started with hers as a jumping off point (and p.s... I didn't jump far). And if you’re not a marshmallow person, don’t let them throw you off. I’m not a huge marshmallow person myself but that’s one of the cool things about this recipe… they mostly melt away. And that brown sugar meringue-ish topping takes the shape of them before they melt which is what gives you all the cool bumps. Seriously, this is one of the most interesting recipes I've ever made. It’s like a science experiment. With chocolate. That you can eat. 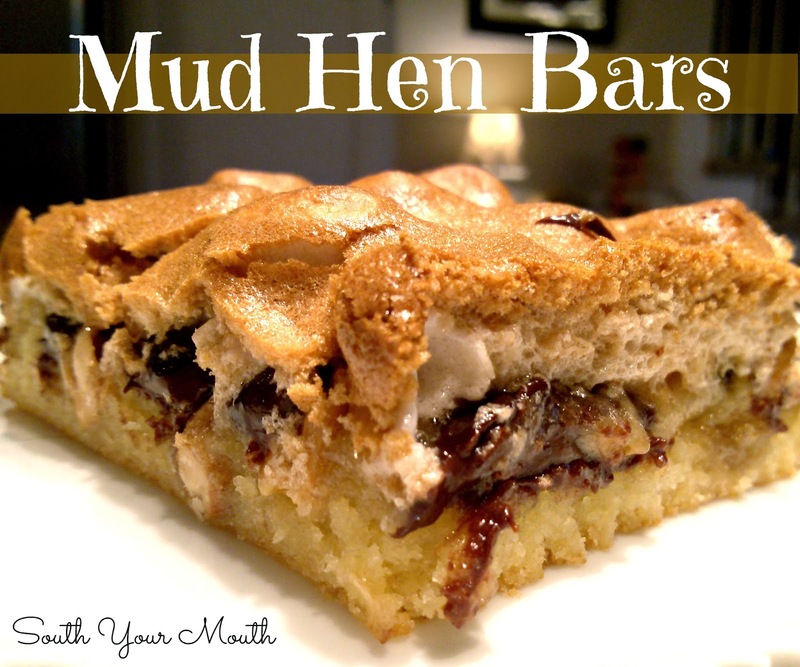 So, here’s the first batch of Mud Hen Bars I ever made. And there’s no doubt, there will be many, many more to come. Combine flour, baking powder and salt in a small bowl and stir or sift to combine. Set aside. With an electric mixer set at medium speed, beat butter and sugar until creamy (about 2 minutes). Add whole egg, egg yolks and vanilla and continue mixing until smooth (about 1 minute). Slowly add flour mixture and mix until all ingredients are just combined. Spray a 13x9 baking pan with cooking spray (or grease with butter or shortening). Add dough to pan and spread evenly until bottom of pan is covered. I covered mine with wax paper and then used my hands to shmoosh and spread the batter – I’ve found that this is the easiest, cleanest way to handle dough like this on layered desserts and bars. Top bottom layer evenly with chocolate chips, marshmallows and nuts. Spread egg white mixture evenly over second layer. Bake at 350 degrees for 25-30 minutes or until top layer is golden brown. Remove from oven and cool for twenty minutes before serving. Store in an airtight container. p.s.... I let Husband talk me into using roasted peanuts but I don't know that I'd recommend them. I've never thought peanuts finished well in baked recipes - they lose too much of their crunch. I'm totally going to convert this to gluten and dairy free. Should be an easy fix, and it looks deeee-lish! I'm from GA and have never heard of such a thing, but this may make it's way to one of my Turkey-day desserts. You are incredible! Best recipes ever. I want to try everything! My mother in TN had a recipe by same name maybe 30 yrs ago. Topping was an egg white meringue affair, not marshmallows. Very rich. Assumed it originated in S. Carolina. That looks fantastic. I tend not to use nuts in baking anymore as so many people have some sort of allergy. I was thinking that frozen raspberries sprinkled among the chocolate and marshmallows might be nice and would certainly look pretty. Definitely making this tonight though!. Love Mud Hen Bars! You have out done yourself with the photo...gorgeous! I love this recipe, and am definitely making it before this year ends! I'm a displaced Texan (in NJ) and we do have some discussions about pa-kahns versus pee-cans! I love them! Thanks a bunch for posting! we all know what pa-KAHNS are for. PEE-cans are what you use when you go camping and don't want to walk to the restroom in the dark. Just taken this out of the oven. It looks so good I've put the oven timer back on cos I couldn't bear to accidentally wait longer than 20 minutes for it to cool down! Oh my. It was every bit as good as I thought it would be! Thanks you so much for sharing! As for my variation. I loved the contrast of the slight sourness of the Raspberries with the sweet marshmallow and chocolate. Only thing I would change is use fresh Raspberries next time as frozen made it a little 'wet'. Wish I knew how to share a photo. Mus Hen Massacre! LOVE IT!! Post the photo on my FB page if you'd like! I forgot about this recipe until seeing it pinned. About 30 years ago a co-worker would always make these. This recipe is exactly as I remember. Thank you for publishing. I've made several batches. never heard of it - I had a similar thing that I made with a lemon curd filling and they were to die for - I think my hips would far prefer me to read this, but the kitchen has just received a new oven. I'm a transplanted southerner (in Ca of all places) and we know this recipe as S'mores Bars. Instead of nuts use crumpled up graham crackers, either choc chips or broken up hershey's bars and marshmellows covered by the egg white mix. This one doesn't sit around long! When I was young, we used to visit a place in Wisconsin called Mud Hen Lake! Unfortunately for me, I never had one of these bars. They look fantastic. Will definitely be trying these. Hi!! I want to try this recipe but can someone tell me, when using the wax film to cover dough and "shmoosh" lol, what did that mean by covering it? The dough? The pan? Or is she referring to just putting the dough down on the wax first, smoothing it out then placing the dough(bottom layer) in the pan. Help! Thanks!! Love this blog!!! Mandy, your idea of putting the wax paper over the dough to mush around is ingenious! I'm reading the steps and it stopped me in my tracks. LOL I thought wow,how many people even have wax paper in their kitchen anymore besides me? (Yea, it doesn't take much to whoop whoop this gal) This tip I will be using and sharing. Thanks! !